Although this area at first seems like a bit of an awkward shape, it is actually very straight forward. 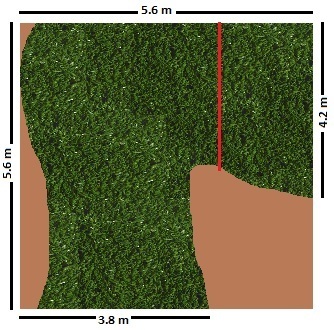 Because you only need to measure the longest width and length you can see that you will only need one piece of Artificial Grass. Remember to always allow yourself 10cm on the length for trimming and acclimatisation. To Order this area you will only need 4m x 5.4m. Try to keep the larger cut outs as big as possible. Although this can be a struggle you may find them useful for other areas. On areas that are of a peculiar shape you need to make sure you allow yourself plenty for joins and trimming. On this area the red line represents the best place to have a join. 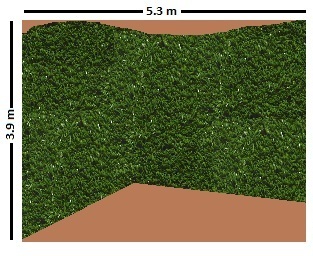 For the larger half you would need to order 4m wide by 5.7 in length (again allowing 10cm for trimming and acclimatisation). When working out your joins, insure that you have allowed the pile direction to flow in the same direction. Alternatively draw out your area the best you can with all the dimensions and send it to us and we will be more than happy to work it out the best way for you. Always draw your area out the best you can. On the larger areas like the one above, start by going round with your tape measure and check where 4 metres land so you can adjust any joins accordingly. Remember to keep the pile direction of each piece going in the same direction. 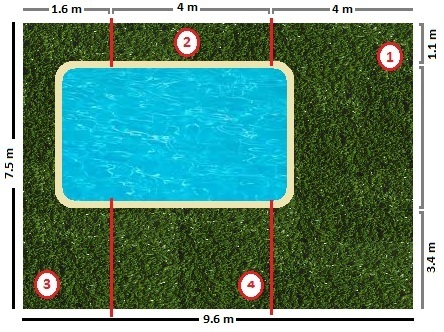 Dont be tempted to measure the pool as a cut out, as this would not allow for corners or any shaped edges on the pool.